Bad balance is a myth. 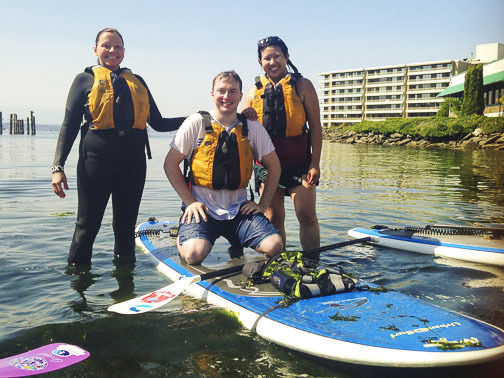 Rob will work with you individually to stand up and paddle with confidence. Rob places students on super stable boards for your height and weight using proven techniques that guarantee your success in standing up, turning and having fun! 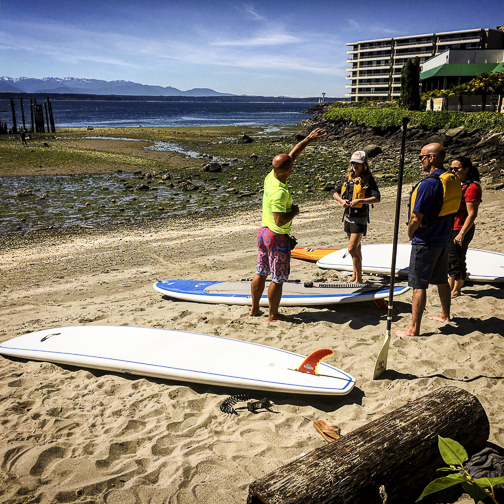 This is the only beginning paddle board class in Seattle where you’ll leave with a ton of info on which gear to purchase, how to plan your first outing on the water, load your board on your car and how to paddle over boat wakes, in wind and walk on the board. Rob covers safety, rescues and how to fall and easily climb back on an inflatable or hard board. You may see harbor seals, bald eagles, sea lions and views of the Olympic Mountains, Mt Baker and Bainbridge and Whidbey Islands. Rob Casey is very knowledgeable about the sport and the surrounding environment. I not only learned basic paddle boarding techniques, but also cool turns, what to do when there are waves, and great safety tips. I’ve taken SUP “lessons” before, but none were as detailed or effective as Rob’s. Shilshole Bay was beautiful – saw lots of marine life like starfish and crabs. I’d definitely take another lesson or tour with Salmon Bay Paddle next time I’m in Seattle. I recently took Rob’s SUP Basics Level 1 intro lesson. Very glad I did. I took the class hoping to get a solid foundation on SUP basics from the ground (or water) up. I left with a solid understanding of the fundamentals, and an appetite to go out again as soon as I can. Rob made it super easy and fun (there was a lot of good conversation during the dry ground orientation and out in the water during “board meetings”). He puts a lot of emphasis on safety and made me rethink ever going out on a board without a leash and PFD. He even followed up after the class with techniques I need to work on. I’m mulling what lesson to take next. Location: Ballard Elks beach on Shilshole Bay in Seattle. This lesson can also be taught at a location of your choice for the same cost in Seattle. Add additional travel fees (and/or ferry fees) for classes outside of Seattle. Duration: 3 hours. Learn at your own pace. Schedule: Private lessons only. Contact me to set up a lesson that fits your schedule! Instructor to Student Ratio: 1:4 or 2:4. Instructor Follow-up: I’ll send you a summary of skills you learned in your lesson. I’ll stay in touch with you after the lesson to assist with finding paddling equipment and offer tips on where to paddle in the NW. Nervous about Standing? I’ll teach you how to sit, kneel and prone (on belly) paddle prior to standing up. He is known for his patience and innovative methods of helping beginners stand up, when they’re ready. Group Rate: 199 per person. 2 – 4 students. All rental gear is included with cost: Stable board, paddle, PFD (life vest), leash, wetsuit, booties, gloves / 179 with your own gear. Individual Rate (1-1): 299. Rental gear free with class cost / 279 with your own gear.